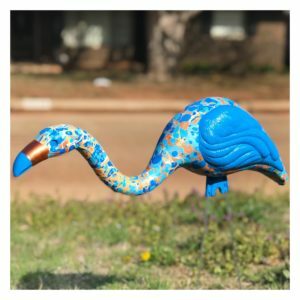 Come bid on flamingos created by local artists tonight, Friday, April 6, from 6-9 pm at GROW, the fundraiser for the OKC Girls Art School. The event takes place at IAO Gallery (706 West Sheridan) on Film Row. I created a blue marbled flamingo specially for the event. Starting bid is $150.